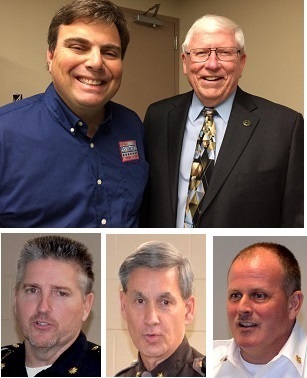 Making presentations to the Class of 2016-17 on Government Day were County Commissioner Brad Armstrong (left in top photo) and Mayor Chuck Fewell. Also speaking to the class were (bottom, from left) Maj. Derek Towle of the Greenfield Police Department; Hancock County Sheriff Mike Shepherd; and Chief James Roberts of the Greenfield Fire Territory. If you want to make a positive impression on Judge Dan Marshall, it will help if you dress nicely and address the bench respectfully. Sweat pants and casual greetings won’t get it done. Judge Marshall, who presides over Hancock County Superior Court 2, was one of a dozen leading officeholders and department heads who spent time with the Leadership Hancock County class on Government Day, held on Wednesday, Jan. 4. The class, the fifth of seven sessions for the Class of 2016-17, served as an introduction to the basic workings of government. But class members also heard some keen — and occasionally humorous — insights about our court system, public safety and the administration of local rule. Marshall, speaking to the 25 class members from inside his courtroom at the Hancock County Courthouse, told the group that decorum is important to him. As the overseer of the vast majority of criminal cases in the county, Marshall runs a tight ship. And that means people appearing before him should conduct themselves accordingly. For example, he urges defendants and others to dress as if “they’re going to church.” T-shirts with inappropriate slogans or images — or sweat pants — probably aren’t going to win much favor from the county’s busiest judge. They likely will get an admonishment and be urged to dress differently next time. The students heard several similarly interesting anecdotes and observations throughout the day, which was organized by LHC board member Bobby Campbell, who served as day chair. Another LHC board member, Dianna Hawkins, also served as a day chair. The class learned, for example, that Hancock County Animal Management is still battling misconceptions about its mission. Debbie Harris, an official at Animal Control, pointed out that the city-county shelter’s euthanasia rate has dropped significantly over the past several years. People still ask, she said, whether the shelter puts down animals because of space constraints or because they remain at the shelter for too long (it doesn’t in either case). During a tour of the Hancock County Jail, Campbell, a captain at the Hancock County Sheriff’s Department, pointed out a new body scanner that will be used to detect contraband being smuggled into the jail. This, he said, will improve the jail’s intake process and increase security. Hancock County is paving more miles of roads thanks to better management of resources and an influx of funding, County Commissioner Brad Armstrong told the group. “Eight years ago (when he took office), county roads were turning to gravel,” Armstrong said of the plight facing the county highway department. “We spent a good six years making cuts, working diligently with department heads” to maximize the county’s resources, he added. 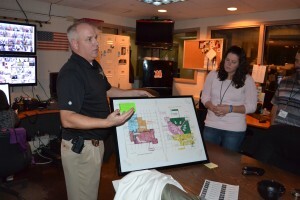 More tornado sirens might be installed in coming years if Hancock County Emergency Management is successful in obtaining grants to pay for them, Misty Moore, head of emergency management, told the class during its visit to the county’s emergency operations center on South Franklin Street. The majority of the county’s two dozen or so sirens don’t work reliably, so fixing them is a priority, she said. Adding new ones in more populous areas is also a key goal, she said. The county still will push out text alerts in emergencies, she said, but the sirens will be an important component in warning residents. Runs at the Greenfield Fire Department continue to increase, James Roberts, chief of the Greenfield Fire Territory, told the group. In 2016, the department made just under 4,000 runs, up from 3,600 in 2015 and up from 3,000 just a few years ago. Roberts said the increased load is putting more pressure on the department as it responds to the needs of a growing — and aging — community. The class also met with state Rep. Bob Cherry and state Sen. Mike Crider who stopped to address the class before heading to the Statehouse for the second day of this year’s Indiana General Assembly session; Greenfield Mayor Chuck Fewell, who urged the class to get involved in civic affairs; Sheriff Mike Shepherd, who helped lead a tour of the jail; John Jokantas, director of communications for the county 911 center, and his deputy, Matt Kelly; Maj. Derek Towle of the Greenfield Police Department, a 1999 graduate of Leadership Hancock County who also served on the LHC board for several years; and Nick Ernstes, a deputy at the sheriff’s department who introduced the class to his drug-sniffing dog, Manni. 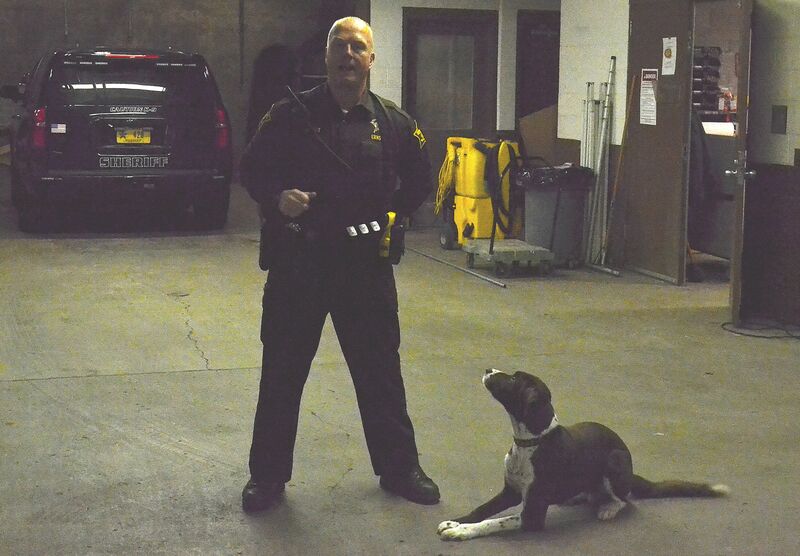 Deputy Nick Ernstes of the Hancock County Sheriff’s Department hid a stash of drugs in the garage at the sheriff’s department. His dog, Manni, sniffed it out within moments. 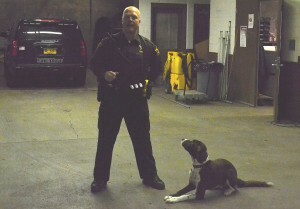 Manni has been instrumental in a number of drug busts in the county. Sgt. 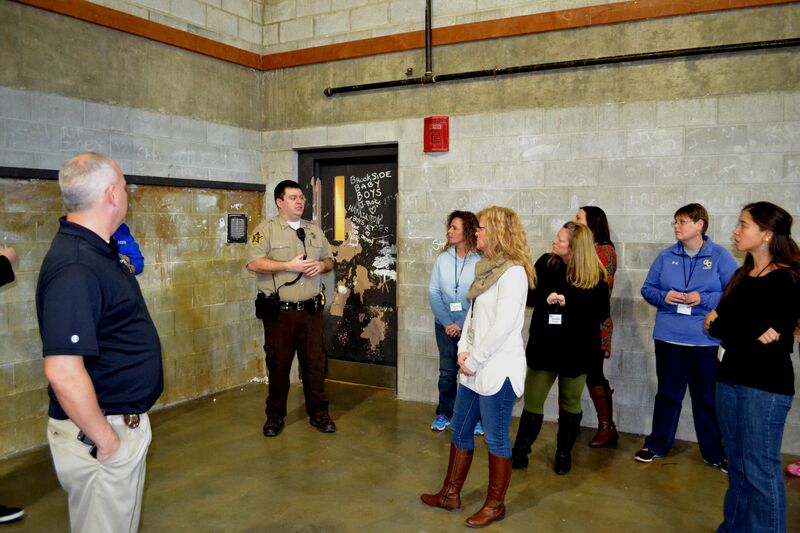 Matt Boots of the Hancock County Sheriff’s Department leads the jail tour into the facility’s indoor recreation area. The graffiti on the door was painted using toothpaste. Painting messages and drawings on the walls of the room is something of a pastime for inmates at the jail. Chief James Roberts of the Greenfield Fire Territory leads a tour of the garage at the downtown fire station. 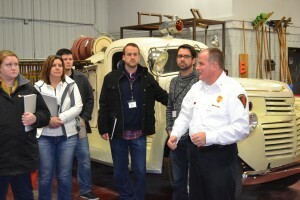 The department’s antique fire truck, which is used during ceremonies, is parked in the garage. The class learned that the fire department went on nearly 4,000 runs in 2016. 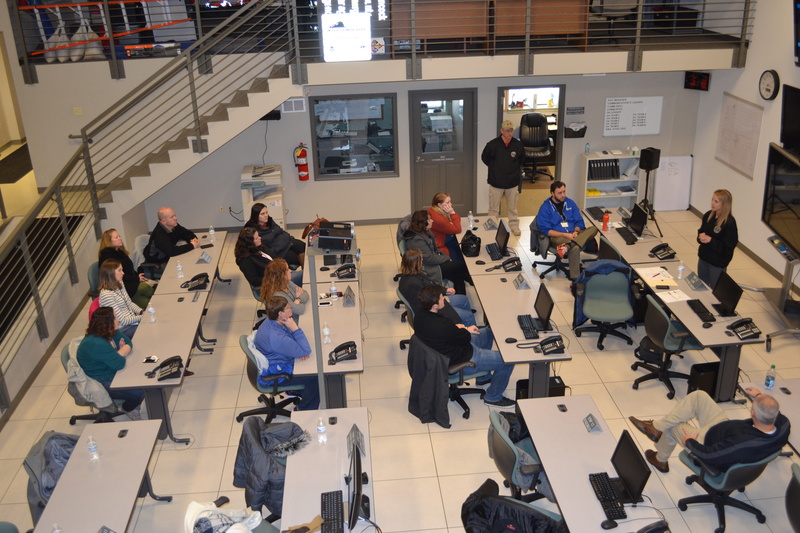 Class members gather on the main floor of the Emergency Operations Center, which would be the nerve center for the county’s response to a large disaster. Leadership Hancock County’s class of 2016-17 will get back to work on Wednesday, Jan. 4, with its fourth class day. The 25 emerging leaders will meet a dozen public officials and public safety officers as part of its Government Day curriculum. Bobby Campbell, immediate past president of the LHC board, is the chief day chair for Government Day. He is a ranking officer at the Hancock County Sheriff’s Department, which will play host to the class as the day’s Vision sponsor. Dianna Hawkins, a graduate of the 2016 LHC class, is the other day chair. The day’s meetings will involve officials from many state and local offices. Highlights will include a tour of the Hancock County Jail, led by Sheriff Mike Shepherd, and a K-9 demonstration by the Greenfield Police Department. The class also will meet Greenfield Mayor Chuck Fewell; County Commissioner Brad Armstrong; and Hancock County’s chief representatives in the Indiana General Assembly, Sen. Mike Crider and Rep. Bob Cherry. You can link to a copy of the schedule below. Class members also will have time to huddle in their project groups as their work intensifies ahead of their presentations in May. After this week, the class will have only two more class days: Leadership I on Feb. 1; and Leadership II on March 1.